The broad spectrum of skills required to manage a world-class shopping centre was an eye-opener for business students from INTI College Sarawak on a study visit to The Spring in Kuching, an experience that brought to life many business and managerial concepts taught in the classroom. On arrival, the visitors were briefed by Andy Song, Leasing Manager of The Spring, on the intricacies of daily operations, variety of the tenant base and services, and the retail outlet’s unique ambience. Song also shared his insights into market segmentation, profiling and innovation, as well as the changing business landscape in terms of emerging new world economies in Asia. “I am in my first semester of the Diploma in Business Administration programme. An industry visit like this is really good exposure and a welcome addition to my studies,” said Eric Enddyson Khung, one of the 26 students that made the trip. 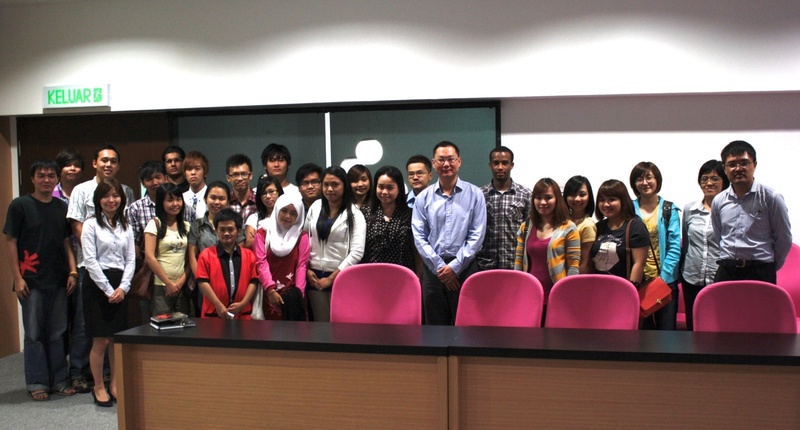 Andy Song (8th from right) with the visitors from INTI College Sarawak. In addition to industry visits, INTI’s students are exposed to real-world projects and guest lectures by corporate and thought leaders from the region to broaden their outlook and enhance their industry-oriented learning experience. The business courses offered at INTI College Sarawak include the Certificate in Business Studies, Diploma in Business Administration, Bachelor of Arts (Hons) in Business Administration and MBA programmes. In each programme, students are guided and supported by a dedicated and experienced team of lecturers. By providing an environment which focuses on student-centred teaching and learning, INTI empowers students to be self-directed, motivated and independent learners. Andy Song shares his insights with the visitors from INTI College Sarawak. Project Based Learning is applied in many courses at INTI. In the past year, INTI students have successfully completed a total of 50 real employer assignments that were formulated to help develop in-demand skills such as problem solving, collaboration and effective communication. For further information on INTI’s programmes, please call 082-570888 or visit INTI College Sarawak at Jalan Stampin Timur in Kuching.